Deathbox has now been defunct since 2005. These last few decks were recently found in our stock room and will be sold off until there are no more. 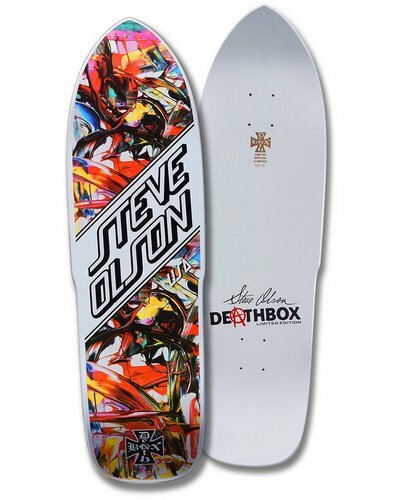 It's a shame the brand didn't survive; great decks came out of their doors. 9.875" x 33.75" 16.75" Wheelbase 7.25" Tail, 5.875" Nose Single Kick, Medium Concave Upturned Nose Limited Edition Deck #46 or 102 Made!!! 9.875" x 33.75" 16.75" Wheelbase 7.25" Tail, 5.875" Nose Single Kick, Medium Concave Upturned Nose Limited Edition Deck #11 or 102 Made!!! 9.875" x 33.75" 16.75" Wheelbase 7.25" Tail, 5.875" Nose Single Kick, Medium Concave Upturned Nose Limited Edition Deck #18 or 102 Made!!! 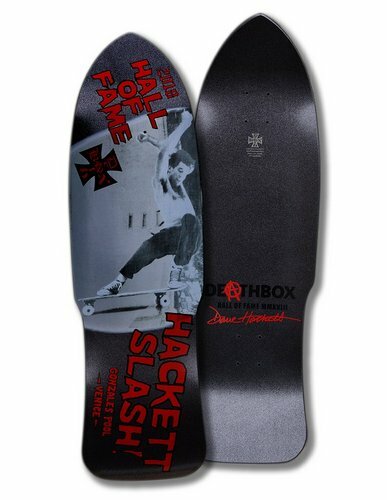 Deathbox Skateboards Dave Hackett Rockett Deck - Silver / 9.875"
Deathbox Skateboards Dave Hackett Rockett Deck - White / 9.875"
Deathbox Skateboards Dave Hackett Rockett SII - Orange / 10.0"
Deathbox Skateboards Dave Hackett Rockett SII - Red / 10.0"